This has felt like a foregone conclusion for over a week, but the Jaguars will sign free agent quarterback Nick Foles, per Ian Rapoport of NFL.com (via Twitter). And it is a huge deal, as RapSheet tweets that the former Super Bowl MVP will land a four-year, $88MM pact from Jacksonville. Mike Garafolo of the NFL Network adds that the deal maxes out at a whopping $102MM (Twitter link), but Adam Schefter of ESPN.com tweets that “only” $50.125MM is guaranteed. After months of discussion as to how the Eagles would handle Foles’ contract, Philadelphia elected to not hit him with the franchise tag once he bought his way into free agency. Teams like Jacksonville who were interested in Foles did not really engage the Eagles in trade talks prior to that decision, as they never expected Philly to tag him in the first place. The Giants were also rumored to have some interest in their former division rival, but the Jags seemed to be the clear favorites all along. Jacksonville’s quarterback situation has long been a hot topic of conversation, especially after the Blake Bortles extension predictably backfired. And in case you couldn’t hear it over all of the rejoicing in Florida, we just learned that Bortles has been cut. 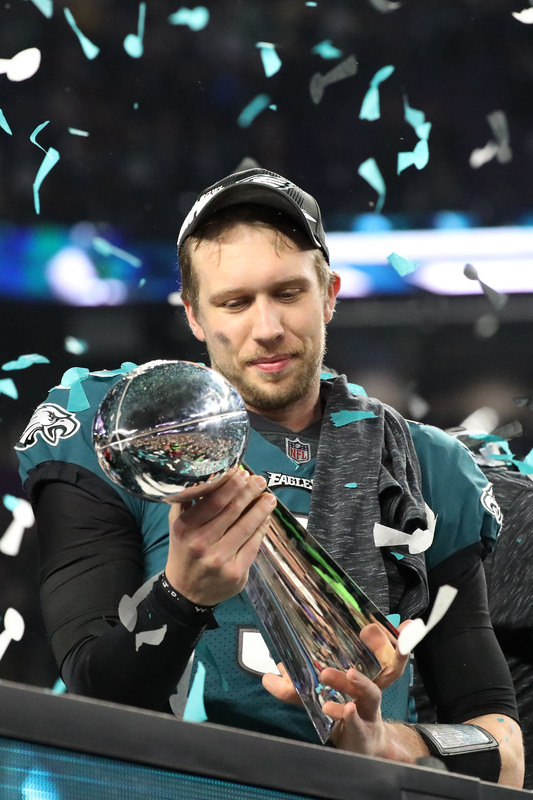 Foles, 30, spent the bulk of his career as a backup, but wound up as the Super Bowl MVP following the 2017 season in one of the best feel-good stories of the century. He was once again called upon in 2018 as Carson Wentz was sidelined by injury. He went 4-1 in his five starts and completed 72.3% of his passes, his highest mark in any of his NFL seasons. He also threw for seven touchdowns against four interceptions. He is not perfect by any means, but he should be an improvement over Bortles, and despite a recent batch of cost-cutting moves, the Jags hope that their core is strong enough to make another run at the playoffs after a disappointing 2018 campaign. As the Combine winds down, the Jaguars are entering the final pre-free agency week as the unquestioned clubhouse leaders for Nick Foles. Mutual interest exists between the Super Bowl LII MVP and the Jags, Ian Rapoport of NFL.com notes (video link). Jacksonville was not ready to trade draft capital for Foles, likely because of a limited market for the veteran quarterback, but has been viewed as the favorite since Philadelphia’s tag-and-trade scenario did not come to fruition. With other teams not nearly as connected to the free agent-to-be, the Jags may be set to receive a discount. They are internally preparing a Foles offer, Jeff McLane of Philly.com notes, and the expectation is they will be able to sign him for a below-market deal (at least, in terms of veteran starters). However, Rapoport expects the deal to be north of what the Broncos gave to Case Keenum last year, envisioning this pact will eclipse $20MM per year. While any starting-QB-level deal will put the Jags up against the cap, considering they hold the least cap space in the league (current $2MM-plus over the salary ceiling), the team needs a starter. The team’s Blake Bortles extension predictably backfired, and if the Jaguars cut the sixth-year passer and do not designate him as a post-June 1 release, they are going to take a $16MM-plus dead-money hit this year. If Jacksonville does make Bortles a post-June 1 departure, it cannot use any of the funds created from the transaction until June. The team may need the modest $4.5MM in cap savings a Bortles release creates to afford Foles in March. However, the Jaguars are shopping Malik Jackson and Carlos Hyde, pointing to releases in the event no one wants to take on these contracts. Cuts of Jackson and Hyde would free up nearly $16MM in space. Marcell Dareus was a cap-casualty candidate, but the former top-five pick restructured his deal. The team also picked up Calais Campbell‘s option. This further points to Jackson being the odd man out, a scenario he expected. Foles was paid better than Keenum as an NFC backup the past two seasons and obviously became one of the most famous backup quarterbacks in NFL history. His non-Philadelphia stays have not produced much, most notably his St. Louis stint leading to Keenum replacing him as the Rams’ starter and Foles considering retirement before joining the Chiefs. But former Eagles QBs coach John DeFilippo is now in Jacksonville as OC. That may give Foles the best opportunity to thrive outside of Philly. Giants Interested In Nick Foles? Giants head coach Pat Shurmur says the team will be moving forward with Eli Manning as the starting quarterback, but not everyone is convinced. For weeks, Tony Pauline of DraftAnalyst.com (on Twitter) has been hearing that the Giants are very interested in Eagles quarterback Nick Foles. For the Giants, it was simply a matter of whether the Eagles would franchise tag the QB or allow him to become a free agent. 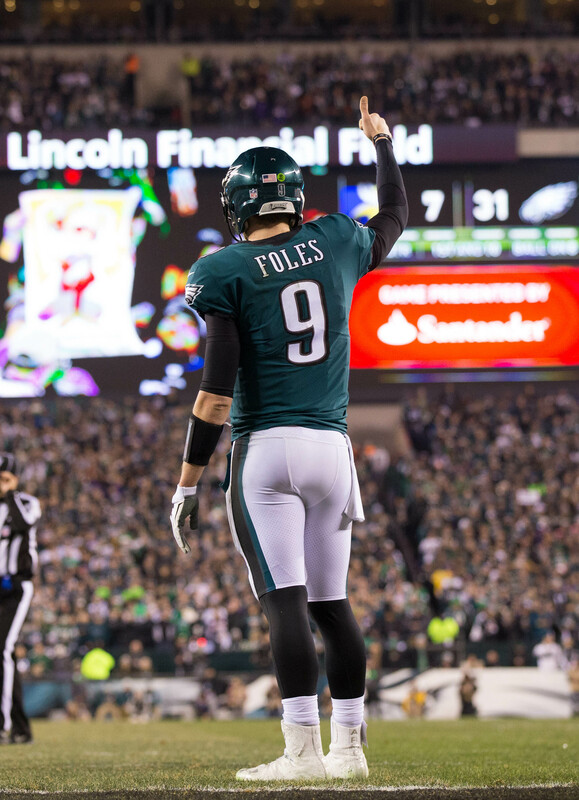 With Wednesday’s news that the Eagles will allow Foles to explore the open market, the stars could be aligning for the Giants to pursue Foles. Of course, the Manning question still needs answering. Shurmur coached Foles in Philadelphia, so it would only make sense for the Giants to consider him. Meanwhile, GM Dave Gettleman isn’t ruling out a veteran signing and Foles represents the best free agent QB option by far. Teddy Bridgewater will also hold appeal for teams, but unlike Bridgewater, Foles has recent game tape and a Super Bowl ring on his hand. News of the Eagles’ franchise tag-and-trade plan failing emerged because of the Eagles’ inability to talk the Jaguars into making a bid for Foles. The Jaguars were not interested in trading for Foles, Ian Rapoport of NFL.com reports (video link), and that led to Howie Roseman shutting down the tag-and-trade process. The Eagles had hoped to place a $25MM tag on their popular backup quarterback, but once the Broncos opted for Joe Flacco and the Jags said they did not want to acquire Foles via trade, Roseman agreed the Eagles would let Foles walk. A 2020 third-round compensatory pick will almost certainly come Philadelphia’s way. 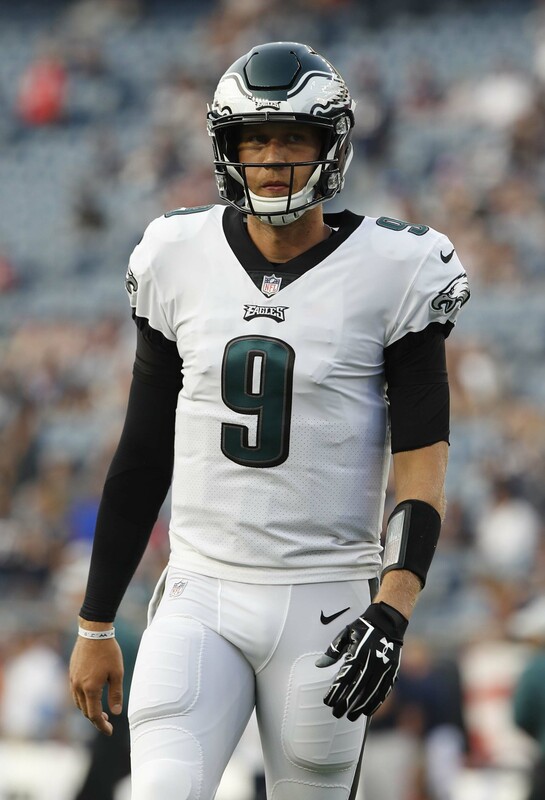 However, the Jaguars remain interested in Foles as a free agent, per Rapoport. They are the favorites to sign him in free agency, Adam Schefter of ESPN.com reports (on Twitter). Given the marketplace, this is unsurprising. The Jaguars have a veteran defense that in 2017 proved capable of elevating a team with a low-end quarterback to the Super Bowl precipice. The Redskins are unlikely to commit franchise-quarterback-level dollars to finding another passer, with Alex Smith on their 2019 books for more than $20MM, and the Dolphins have not given an indication they are looking to spend big here either. The Giants are, as expected, moving forward with Eli Manning — despite Pat Shurmur’s history with Foles. This leaves the Jags in an interesting spot. And the fact that they may be a strong favorite likely impacted the team’s decision to avoid giving up a draft choice in a tag-and-trade scenario. Jacksonville’s standing on this front could also affect how much Foles can command as a free agent. John DeFilippo is now the Jags’ OC, and the team has soured on Blake Bortles after a five-year run did not produce what the franchise hoped. It would be an upset if Foles did not end up in north Florida next season, though thanks to the ill-advised Bortles contract leading to a $16MM dead-money charge, the Jaguars making this quarterback switch will be costly. Nick Foles will be a free agent in March. On Wednesday, Eagles GM Howie Roseman confirmed that the team will not be placing the franchise tag on the quarterback. “He deserves an opportunity to lead a team,” said Roseman (Twitter link via Tom Pelissero of NFL.com), adding that it was a hard decision for the Eagles. With Carson Wentz entrenched as the starter and little in the way of cap space, franchising Foles was not a real option, unless the Eagles were willing to thin themselves out in other areas. A tag-and-trade scenario could have allowed them to recoup something for Foles, but it sounds as though the league’s other QB-needy teams sat on their hands with a belief that this would be the ultimate outcome. Foles spent the bulk of his career as a backup, but wound up as the Super Bowl MVP following the 2017 season. It stands to reason that he’ll cash in next month since he is far and away the best starting option available. Foles, 30, was once again called upon in 2018 as Carson Wentz was once again sidelined by injury. He went 4-1 in his five starts and completed 72.3% of his passes, his highest mark in any of his NFL seasons. He also threw for seven touchdowns against four interceptions. This year’s free agent QB crop is slim, as per the usual. Foles is expected to draw the interest of teams like the Jaguars, Dolphins, and Redskins en route to a deal that should pay him higher than the league average starting QB. The Broncos “kicked the tires” on acquiring Nick Foles from the Eagles before sending a fourth-round pick to the Ravens for quarterback Joe Flacco on Wednesday, tweets Mike Klis of 9News. Second, the Broncos consider Flacco the better financial value, reports Klis. Flacco will collect an $18.5MM base salary in 2019, but neither that figure, nor any of his future base salaries, are guaranteed. 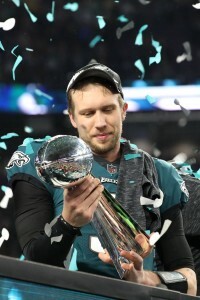 Foles, meanwhile, is expected to be traded while on a franchise tag that will entitle him to a fully guaranteed, ~$25MM 2019 salary. A Foles extension, as Justis Mosqueda of Optimum Scouting recently detailed, will likely cost an acquiring team north of $40MM in total guarantees. Additionally, the Eagles are reportedly seeking at least a third-round pick in exchange for Foles, while the Broncos were able to acquire Flacco for only a fourth-round choice. 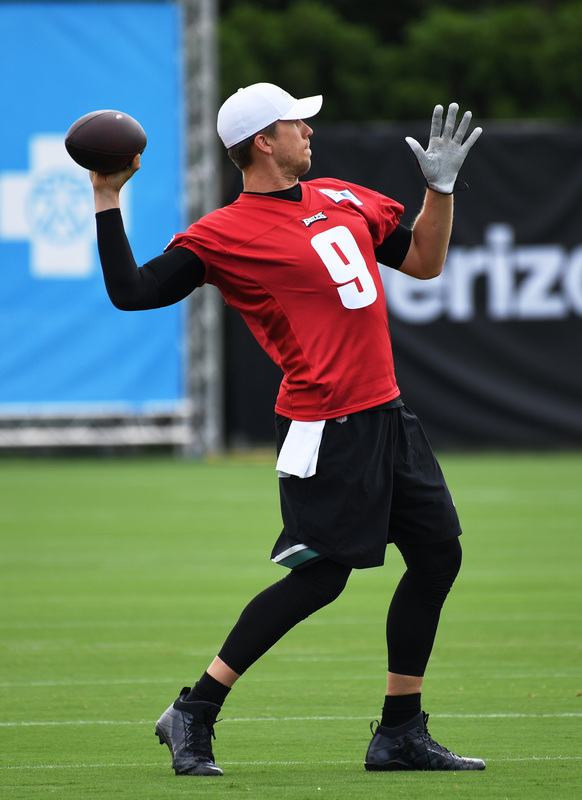 If the Eagles franchise tag Nick Foles and attempt to trade him, as is expected, they’ll be taking somewhat of a risk, writes former NFL agent and current CBS Sports analyst Joel Corry. “There is a school of thought that franchising Foles strictly for trade purposes violates the CBA. Language requiring a good-faith intention to negotiate with a tendered player or keep him for the upcoming season at his tender exists in the CBA”, Corry points out, although he notes it’s unlikely to be enforced. The real issue is the cap ramifications of tagging and trading Foles, Corry writes. “With Philadelphia’s current contractual obligations, a Foles franchise tag would put the Eagles roughly $20 million over the projected salary cap. Several contracts would need to be restructured and/or players released just to be able to carry Foles’ cap number for as long as he remained with the Eagles even if he was dealt as soon as the 2019 league year started”, he observes. It’s an interesting point, and if the Eagles can’t agree in principle with another team on a good deal for Foles before the franchise tag period is over, they may not end up tagging him after all. With free agency right around the corner, Jason Fitzgerald of Overthecap.com broke down the running backs most likely to be cut this offseason. Carlos Hyde, who has a salary of $4.7MM for the Jaguars while only playing a bit role the second half of the season, is on top of the list. One somewhat surprising name he floats is LeSean McCoy by the Bills, writing that “it’s probably best for both sides to move on.” The team has said in the past that they plan to keep McCoy for 2019, but if they go all in on a youth movement, it wouldn’t be shocking if McCoy wanted out so he could go to a contender in the twilight of his career. In case you missed it, the Ravens believe the presence of Lamar Jackson will help attract free agents this spring. Well, that didn’t take long. We learned a few hours ago that the Eagles were planning on picking up Nick Foles‘ $20MM option for next season, and now ESPN’s Adam Schefter is reporting (via Twitter) that the veteran quarterback will void the option and buy his way back to free agency. Of course, this isn’t a very surprising development, as it had been assumed Foles would pay the $2MM it’d take to become a free agent. However, as our own Sam Robinson detailed earlier, this is likely the start of an extensive ordeal for the two sides. The Eagles are expected to slap Foles with the franchise tag, which the quarterback is then expected to accept. Philly would subsequently shop the former Super Bowl MVP, with the team reportedly seeking a third-rounder in exchange. Fortunately, we should have some clarity on at least the first step of this process relatively soon. ESPN’s Tim McManus points out (on Twitter) that the window for teams to use the franchise tag is between February 19th and March 5th. Of course, with the Eagles in a precarious cap situation ($13MM over the ceiling), they’d likely want to assure that they have a trade lined up before they make such a financial commitment. 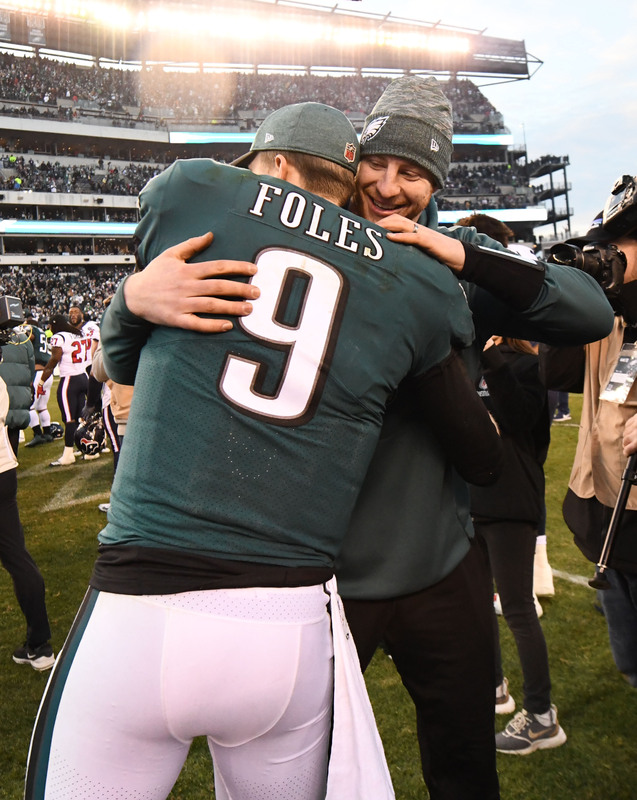 Despite the quarterback’s postseason heroics, the Eagles turned back to Carson Wentz in 2018. However, when the former first-rounder was lost to injury, Foles has another shot at the starting gig. In five games, the 30-year-old completed 72.3-percent of his passes for seven touchdowns and four interceptions.